What is political art? What is a committed artist? This class session originated in a course about the changing definitions of art and aesthetics over time, funded by an Enduring Questions Grant from the National Endowment for the Humanities. The class met for three-hour seminars, with an additional film screening each week, so the information in this session may be significantly more than an instructor will require for a typical class; it can be considered for two 75- to 90-minute sessions. It has been included in its entirety, nonetheless, so that an instructor at any point in their semester might pick and choose the images or historical moment that best fits into their own syllabus. The class reverses the convention of faculty lecture followed by student discussion and enables the class to probe the questions first, and then, secondly, apply them to a number of artworks shown in a loosely structured lecture format. Although the class is topical rather than strictly chronological, each week targets at least one historical period and moves sequentially throughout the term. This section of the class is focused on selected works from the late eighteenth, nineteenth, and early twentieth centuries, with the inclusion of a few twenty-first-century artists, including the Chinese dissident Ai Wei Wei. This goal of this section is to examine the relationship between art and politics—not only how art reflects political ideologies or the political events of any given historical moment, but also how the artist can be examined as a committed worker in the political realm. This class will look at how political thinking has impacted the arts, both in terms of style and subject, and in terms of moments of heightened transformation in history. We also consider how the arts have affected history and politics—seeing art as a means of direct political action as well as the means to instigate social change, sometimes in a quieter way. This topic is surely vast, with the impulse to delve into the endlessly circular definitions of “What is art?” “What is propaganda?” and “What is the political?” To avoid this pitfall, this lesson uses a methodology that results in the formation not of answers but of new questions, maintaining a Socratic approach and using a series of visual objects selectively studied with historical precision. We demonstrate that, while questions about art remain in flux, the details about art and its relationship to political history can be based on evidence and specific events. While they may lie outside of the normal art historical canon, reading essays by Leo Tolstoy and Jean-Paul Sartre critically and comparatively makes a valuable addition to this pedagogical process. Using these texts, students are able to explore unexpected ideas about pleasure, beauty, purpose, and process in the context of what both writers call for: a politically committed artistic practice. How do we discuss the relationship of art to politics (subject, style, material, format, context, intention)? Are concepts of beauty and pleasure inherently in conflict with art made for a political purpose? What is the relationship of artistic freedom to political commitment? Must an artist take a committed political stance? Is commitment the same as making art that is enlightening or educational? How do class, race, and gender play into expectations about political art? Are art and propaganda mutually exclusive? 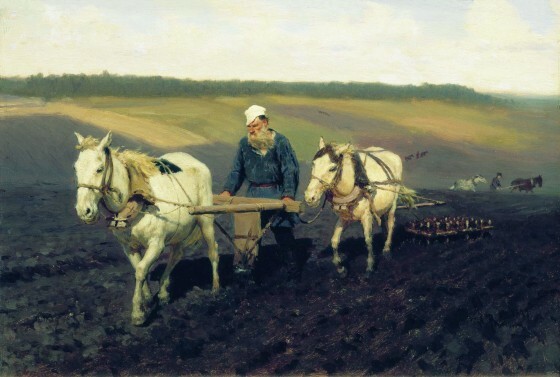 Ilya Repin, Tolstoy Plowing, 1887. Jean-Paul Sartre, What is Literature? (1949) Cambridge, MA: Harvard University Press, 3rd ed., 1988, [especially chapters 1–3]. Leo Tolstoy, What is Art (1898) (Penguin Classics). London and New York: Penguin, 2004. For additional background or follow-up information, the readings that follows are a combination of texts specifically geared towards art and politics, works that address some of the artists highlighted in the Content Suggestions section below, and writing that represents an art historical methodology concerned with politics, social history, and a type of art criticism that engages with ideology. It is by no means meant to be exhaustive but will guide the user to both new and canonical texts that might prove useful. Antliff, Allan. Anarchy and Art: From the Paris Commune to the fall of the Berlin Wall. Vancouver: Arsenal, 2007. Baxandall, Lee and Stefan Morawski, eds. Marx & Engels on Literature and Art: A Selection of Writings. St. Louis: Telos Press, 1973. Beaumont, Matthew, ed. As Radical as Reality Itself: Essays on Marxism and Art for the 21st Century. Oxford and New York: Peter Lang, 2007. Boime, Albert. Art in an Age of Bonapartism, 1800–1815. Chicago: University of Chicago Press, 1990. Boime, Albert. Art in an Age of Civil Struggle, 1848–1871. Chicago: University of Chicago Press, 2007. Boime, Albert. Art in an Age of Counterrevolution, 1815–1848. Chicago: University of Chicago Press, 2003. Boime, Albert. Art in an Age of Revolution, 1750–1800. Chicago: University of Chicago Press, 1987. Bradley, Will and Charles Esche, eds. Art and Social Change: A Critical Reader. London: Tate, 2007. Chave, Anna. “New Encounters with les Demoiselles d’Avignon: Gender, Race, and the Origins of Cubism.” Art Bulletin. v. 76, no. 4 (1994), 597–612. Clark, T. J. The Absolute Bourgeois: Artists and Politics in France, 1848-1851. Princeton: Princeton University Press, 1982. Clark, T. J. “The Conditions of Artistic Creation” (1974) in Eric Ferme. Art History and Its Methods. London: Phaidon. 1995. 245–253. Crow, Thomas. Painters and Public Life in Eighteenth-Century Paris. Yale: Yale University Press, 1985. Egbert, Donald Drew. Social Radicalism and the Arts in Western Europe. New York: Knopf, 1970. The Great Utopia: The Russian and Soviet Avant-Garde, 1915-1932. New York: Guggenheim/Rizzoli, 1992. Harrison, Charles, Paul Wood and Jason Gaiger, eds. Art in Theory: 1815-1900: An Anthology of Changing Ideas. Oxford: Blackwell, 1998. Harrison, Charles, and Paul Wood, eds. Art in Theory: 1900-2000: An Anthology of Changing Ideas. Oxford: Blackwell, 2003. Joffe, Dennis G. and Frederick H. White, eds. Russian Avant-garde and Radical Modernism: An Introductory Reader. Brighton, MA: Academic Studies Press, 2012). Kachurin, Pamela. Making Modernism Soviet: The Russian Avant-Garde in the Early Soviet Era. Evanston, IL: Northwestern University Press, 2013. Leighten, Patricia. The Liberation of Painting: Modernism and Anarchism in Avant-Guerre Paris. Chicago: University of Chicago Press, 2013. Leighten, Patricia. Re-Ordering the Universe: Picasso and Anarchism. Princeton: Princeton University Press, 1989). Leighton, Patricia. “The White Peril and l’art nègre: Picasso, Primitivism, and Anti-colonialism.” Art Bulletin. v. 72, no. 4. December 1990. 609–630. Maynard, Solomon. Marxism and Art: Essays Classic and Contemporary. Detroit: Wayne State University Press, 1979. Rockhill, Gabriel. Radical History and the Politics of Art. New York: Columbia University Press, 2014. Schapiro, Meyer. Modern Art, Nineteenth and Twentieth Centuries. New York: Braziller, 1978. Shapiro, Theda. Painters and Politics: The European Avant-Garde and Society. New York: Elsevier, 1976. All art is part of its political context, and this is particularly true in times of social transformation and crisis. However, not all art is so clearly politically motivated, and not all artists are committed to seeing their art as part of a political system. Furthermore, not all political art is about resistance, revolution, or change; some political art is about maintaining the status quo. Art and architecture are often demonstrations of control and power, whether the iconography is clearly polemical or not. Some powerful art is monumental and expresses its power through its scale and permanence, suggesting a commitment to reflect the strength and supremacy of the ruler or the state. Some powerful art is ephemeral, incendiary, and used to instigate change or call for protest. This class session provides an opportunity to reflect on the narrative of art history by underscoring questions of politics and commitment that have unfolded throughout the course. If your course has covered such themes as art and authenticity, this lecture should allow you to address that legacy directly in the context of art and political commitment. Ask the students to compose questions about the relationship between art and politics. Refer back to some art your class might have seen thus far that deals with the political in art but that may or may not have been discussed in that context the first time around. For example, scenes of a mighty God overseeing the weighing of the souls on Autun Cathedral brought fear to the twelfth-century viewer and reinforced the power of the Church, while Albert Bierstadt’s views of the American West in the era of the Civil War are surely indicative of the moral quandaries raised by a radically transformed United States. Although often used to discuss questions of the religious, transcendent, and the sublime in art, these works point towards a re-questioning of art and its histories when considered from the point of view of political power and influence. Similarly, as important cultural institutions, museums are places of power, and the methods of exhibiting non-Western art in Western contexts might be used to examine questions of colonialism and appropriation.. Tribal art seen in the museum could be considered alongside the original purpose of that object. What questions emerge about power and the aesthetics of “othered” cultures? Discuss the question of politics in relationship to cross-cultural exhibition making. Ask the class to suggest other works of art covered in the class to date—how might these objects be considered political? Bearing in mind what we know of the circumstances in which these previous works of art were made, what can we conclude based on direct evidence—and what can we speculate—about the relationship of art to politics? What about the role of the patron or the political figure? How much have we learned about the relationship of art to either the political establishment or what might be called a politico-artistic resistance? Ask students to consider the survey text (Elke Linda Buchholtz, et al, Art: A World History; New York: Abrams, 2007) and the slide presentations available on the course website, as well as the Metropolitan Museum of Art’s Timeline of Art History (used earlier in the term): how is this art political, and how does the history of art treat the politics of this art? These questions can then be used to return to the idea of commitment as discussed in the texts by Tolstoy and Sartre. Begin by making a collaborative outline of the core ideas of both readings with the class as a whole. In preparation for class, ask students to mark some key passages in the texts that they believe represent the authors’ ideas about art making and political commitment. Students might then break into small groups to discuss two core questions: “What is a committed artist?” and “Are all artists ideological?” Students will be asked to use their chosen passages to support their thoughts on these questions as addressed by Tolstoy and Sartre. Students can then report out from their discussions when the class comes back together, and the collaborative outline will be updated as necessary. For a shorter format, you might suggest that much of the preparation for this discussion section be done at home, i.e., providing the questions about authenticity and bias ahead of time to expedite the in-class discussion. Together, the class can address questions of critical reading: do we read these authors as more or less authoritative about the nature of art because they are famous literary figures? Also note biases of gender and ethnicity: do we favor seeing Western art as political? What about art made by men? Finally, to conclude this section, a few portraits of these writers—a naturalist painting by Ilya Repin of Tolstoy Plowing (1887), a Symbolist print of Tolstoy by Felix Vallotton (1895), a famous photograph of Sartre by Henri Cartier-Bresson (1946), and an abstract and expressionistic etching of Sartre by the émigré artist Wols (1948) can be used to discuss questions of abstraction and representation in relationship to political purpose. The goal is to apply our questions about art, politics and commitment to a selection of images from the late eighteenth to early twentieth centuries, focusing on questions of subject matter, style, historical context, site, materials, purpose, and audience. This part of the class is a combination of lecture (historical and biographical material combined with formal analysis) and a targeted discussion of how the broad issues outlined in part one might be applied to specific works of art. Students are asked to apply the ideas outlined above to the works shown. This section directly engages with some of the dominant themes from the readings. Jean-Honoré Fragonard’s The Swing (1767) can be compared with Jacques-Louis David’s Death of Marat (1793) to illustrate the differences between Rococo and Neoclassical art and to engage with the didactic nature of art in the Enlightenment. This comparison will also be used to investigate Tolstoy’s complaint about bourgeois “pleasure” in relationship to artistic purpose. It can also be used to discuss Sartre’s notions of artistic freedom alongside his emphasis on different forms of writings and narrative structures. Can his analyses of the political impacts of poetry and prose be applied to paintings? This section continues the discussion of Neoclassical art and questions of artistic message while also introducing the idea of historical stories to address contemporary politics, using a comparison between David’s Oath of the Horatii (1784) and Angelica Kaufmann’s Cornelia, Mother of the Gracchi, Pointing to her Children as Her Treasures (c. 1785). Next, we turn to David’s Death of Marat in order to discuss questions of adaptation and the way in which some political works of art continue to have a powerful legacy and inspire copies. David painted the portrait in July 1793, shortly after the assassination of Marat, an important leader of the French Revolution. The painting shows Marat, murdered in his bathtub—a place where he often had to work because of a skin ailment. The dead Marat is depicted in a position reminiscent of the martyred Christ of the Pietà, and this connection points to comparisons with Medieval and Renaissance art, as well as to the use of history to examine contemporary political issues. The painting of Marat also played a central role in Marat’s funeral and was carried as part of the burial parade—a spectacle also arranged by David. An analysis of the classical composition, the moral virtues implicit in the genre of history painting, and the melding of propaganda with “high art” illustrate the complexity of discussing art with a politically committed purpose. There are a number of provocative comparisons that can be made to David’s painting: contemporaneous popular prints of the murder of Marat; an early death mask and David’s drawing of it; a film still made after the painting (one of the earliest examples of film made by Georges Hatot for the Lumière Company in 1897); Picasso’s The Death of Marat (1934) ; a video by Robert Wilson in which Lady Gaga plays the role of Marat; and a piece of environmental art from 2008 in which the Brazilian artist Vik Muniz turned a landfill into an image of David’s painting, using garbage to make an image that can only be recognized when photographed from above. The lecture can pause in this case to ask the class to discuss the political impact of each of these adaptations. David’s later image of Napoleon Crossing the Alps (1801) quickly complicates the artist as a revolutionary, particularly when compared to Francisco Goya’s image The Third of May, 1808 (1809). Questions of authority, and of the use of historical and Christian imagery can again be raised here in the context of the Napoleonic wars. We can also consider here Goya’s print series The Disasters of War (1810–20) for its horrific, gruesome message about how power is used, while also raising questions about Goya’s changing relationship to authority and political commitment. In this context, the discussion might address other works, such as J.M.W. Turner’s Slave Ship: Slavers Throwing Overboard the Dead and the Dying—Typhoon Coming On (1840) and John Constable’s painting The Haywain (1821) as a means to explore how an image shown in one thematic or historical context can be re-examined to represent the relationship between art and politics and the idea of the committed artist. For example, Turner is often placed in a discussion of the power of nature and Enlightenment theories of “the sublime,” while Constable is representative of a controlled landscape and “the picturesque.” Both are good examples of the importance of the genre of landscape painting to both the Romantic and Realist movements in Europe at this time. Yet, the Slave Ship has been connected to a specific event in 1781—when the captain of a slaving ship chose to throw overboard the dead and the dying because he could only collect insurance for slaves “lost at sea” and not for those who died on board. The case was scandalous at the time, and continued to be an important example of the abolitionist cause in 1840. Constable’s painting, on the other hand, can be used to introduce the idea of the politics inherent in what isn’t being shown: in this case, the tumultuous agricultural revolts taking place in the rapidly disappearing British countryside. Although a seemingly idyllic image of rural labor, the industrial revolution was threatening the nature of land ownership, including the property owned by Constable’s family. The need to decode these historically specific details in order to unpack the political messages can be used here to raise questions of the lasting nature of political meaning. If we struggle to see these works as specifically political in the absence of historical details, how does that empower the art historian? The Barbizon landscape painters of the mid-nineteenth century posed a post-revolutionary challenge to the strict control of the French Academy; however, the work of Jean-François Millet also raises interesting ideas about the question of the political intentions of the artist. Millet’s The Gleaners (1857) and his Man with a Hoe (1863) seem to celebrate the downtrodden rural worker by raising him as a worthy subject for art and painting him in a way that beautifies his body and the land. Comparisons between Millet’s The Sower (1850) and images of the “Labors of the Month” throughout history—on the portal of twelfth-century Cathedral at Autun, the fifteenth-century calendar pages in the Très Riches Heures du Duc de Berry (1412–6) by the Limbourg Brothers, Bruegel’s laborers from the sixteenth century (The Corn Harvest (August), 1565), the adaptation Sower with Setting Sun (1888) by Vincent Van Gogh, Social Realist images of labor by Dorothea Lange (1935–6), Thomas Hart Benton (1943), and Diego Rivera (1951), or even agit-prop images from communist Russia and China—indicate the power of images of work. Yet, the use of the image for political purposes—the painting was colloquially called the “Sower of Rebellion” despite Millet’s disavowal of an incendiary purpose—raises questions of ambiguous political commitment. This issue is further explored in a comparison to the more clearly polemical treatment of the figures in Gustave Courbet’s The Stone Breakers (1849), where the titular figures’ poverty is brought to the fore. The pitiful state of the torn clothing and bent backs of the old man and young boy are signals of their rough existence, while they labor to break large stones into smaller pieces of paving gravel. Both figures are turned away from the viewer, an arrangement that functions in multiple ways. On the one hand, it brings the viewer into the composition as we face the same direction as the man and boy. Despite the details of their clothing, however, we cannot see their faces, and they are not recognized as individuals—they might stand for the masses, or even for “everyman.” Finally, the back-turned poses also contribute to the way in which the overall composition compresses the figures: the canvas is too small for them—the man can not stand up and stay within the frame—while at the same time the hill that rises behind them, leaving only a small corner of horizon line, creates a shallow space within the canvas. They are trapped in the composition as they are trapped in their poverty. The French artist Honoré Daumier is also of interest here. Daumier’s political lithographs, including “Gargantua” (1832) were made for a popular audience and published in the oppositional journal La Caricature. Daumier’s blatant satire and skewering of the Restoration monarchy led to new censorship laws and his imprisonment. Similarly, his print “Rue Transnonain” (1834) depicted the aftermath of the government massacre of a family in their home—mother, father, baby and grandfather—in reference to the brutal aftermath of a revolt in a working-class district. Following years of censorship and fines, Daumier turned to social satire, as represented in his painting Third-Class Carriage (1862–64) where a nursing mother in coach suffers the disdainful look of the bourgeois in the neighboring seats. Another cartoon by Daumier can introduce the topic of the rebuilding of Paris under Napoleon III, when the narrow cobblestone streets and disease-ridden, overcrowded housing of the city was torn up and replaced by wide boulevards, grand apartment buildings, and new civic structures like the Paris Opera. Daumier’s images parody the inconveniences, showing a sense of loss, while also gently mocking a number of Parisian “types.” A concentrated and detailed study of Claude Monet’s Boulevard des Capucines (1873) can be used here to discuss the results of Napoleon’s overhaul of the city, including the benevolent introduction of light and air, of gardens and promenades—but also the more strategic removal of the stones and narrow passageways used to barricade the streets and inhibit the movement of government troops during the French revolutions. Comparisons to contemporaneous photographs by Charles Marville—hired by the city to record the places that were being razed—are nonetheless challenging for us to read as politically committed art. Moody and desolate images taken at dawn to avoid any human activity, these images suggest that nostalgia might be an impediment to a political reading. While it may be hard for students to see today, given the common view of Impressionism as an art of pretty pictures, the historical decoding of this work by Monet demonstrates otherwise. The painting was first shown in the studio of the photographer Nadar that overlooked the Boulevard—thereby inviting comparison between the painting and the real-time view. The exhibition was the first Impressionist exhibition—scheduled for 1871 but delayed because of the Franco-Prussian War. Showing the work outside of official exhibition venues was also a political move. It was in response to this exhibition that the descriptive term “Impressionism” was used as a form of derision, implying that the “little black tongue lickings” of paint were not worthy of consideration as a finished painting. In 1873, the Boulevard des Capucines was a site of glamour, frequented by Baudelaire’s flâneur, and the well-dressed bourgeoisie—those out to see and be seen, with the new Paris Opera in the background. Yet, this was also a former site of revolutionary activity, as everyone viewing the painting then would have known. The “Fusillade on the Boulevard des Capucines” took place in 1848, and 36 people died in a battle between an angry mob and the police. But does his knowledge of all that make Monet a committed artist? This section then moves on to consider other socially significant subjects, as in Edgar Degas’s Ironers (1884) and In a Café (Absinthe) (1873). Does it matter that we find pleasure in these works? These works of ironers and drinkers were influential for Picasso, who painted a series of women ironing at the turn of the century, concentrating on the underside of Paris. The political sympathies of these paintings can be used to introduce the political subject matter in other more experimental works by Picasso, such as his painting Les Demoiselles d’Avignon (1907) and his Cubist collage Still Life with Bottle of Suze (1912). Once deciphered, these works have been read, respectively, as a critique of colonialist brutalities in central Africa and an anarchist outcry against the Balkan War, though today our historical context encourages us to critique the inherent racism and sexism of Picasso’s treatments. Questions of historical distance, authorship, and audience are important here, as we seek to unpack questions of Picasso’s commitment and our own. This subsection concludes with a discussion of the complex political iconography of Picasso’s Guernica (1937) and its continued appropriation of traditional poses like Michelangelo’s Pietà (1498–9), much like we saw earlier surrounding David’s Marat. Once considered a radical artist, Kazimir Malevich’s images of peasants from the period before World War I suggest his interest in social subjects, the politics of serfdom, and the rebuttal of officially sanctioned art, through his emulation of a “primitivizing” folk art style. Other works, like his designs for the absurdist play Victory over the Sun (1913) and his abstract painting Red and Black Square (1915), were regarded as equally insurgent because of their radical formal properties and their challenge to official art. After the Russian Revolution, when Malevich was given a sanctioned position as an art teacher and cultural statesman by the Bolshevik government, his non-objectivity was put to direct, propagandistic, partisan political use. His designs for the “Committee on Rural Poverty” from 1918 are here compared with examples of painted trains, walls, and other forms of Bolshevist propaganda. To put Malevich into the context of artistic activism, political posters by his colleague El Lissitzky are also examined here, as is Vladimir Tatlin’s architectural project Monument to the Third International (1919–20)—including images of it being paraded through the streets of Leningrad. As a means of conclusion, the lecture considers a quintessential image of the political activist—the raised fist—in art. Yet, as a stand-in for the artists themselves, this political figure is more complex to decipher. Three works by Käthe Kollwitz—Outbreak (1903), Bread! (1904), and Never Again War! (1924)—are used to introduce the theme, which are then compared to Eugène Delacroix’s painting Liberty Leading the People (1830), Max Pechstein’s broadsheet Call to All Artists! (1919), Otto Dix’s print series The Art of War (1924), Gustav Klutsis’s Soviet constructivist poster, We Will Fulfill the Plan of Great Endeavors (1930); an anonymous U.S. recruiting poster from 1943—“We have just begun to fight!”—as well as photographs and posters from the Civil Rights and Vietnam War eras (including both American and Chinese images). A Situationist-designed poster of a raised fist from the Paris unrest of May 1968 is studied in the context of street graffiti and, in conclusion, similar images from the Occupy Movement of recent years. The raised fist is a clear call to action—but does it always mean the same thing, regardless of context or intended audience? Ask the class to think back to Tolstoy and Sartre. Using an image and (in the case of the Occupy Movement) an event that students recognize, ask the students if they can bring together artistic agency and political actions. What works of art—in any medium—do they think represent the committed artist of the twenty-first century? Ai Wei Wei, Dropping a Han Dynasty Urn, 1995. Performance. This course contains an additional film screening of Ai Wei Wei: Never Sorry by director Alison Klayman about the titular Chinese dissident. The film touches on many aspects of political imagery vs. political practice, of the relationship of the artist to the state, of morality, and of Sartre’s concepts of freedom and commitment. Because much of his art is site-specific, temporary, and yet also visually striking, Tolstoy’s ideas of beauty and pleasure, and of the economic issues central to the commerce of art are also at play in this film. Ai Wei Wei is an artist that breaks the boundaries of contemporary art making—even his actions on social media might be seen as a kind of political activism merged with performance art. But is this really visual art, or is it political spectacle? In fact, does our media-saturated world reflect the end of art as we know it? Or, does it require a renewed sense of our need for art—perhaps in differently mediated platforms? Refer to Tolstoy and Sartre if they help you make your argument. Do the ideas of Tolstoy and Sartre about pleasure and freedom (respectively) conflict? What other questions about art and commitment are raised by the process of comparing these texts? (What Is Art and What Is Literature?) Use these ideas to discuss three specific works of visual art seen in class.